:)i think its a simply yet slick fone:) yea?? premsingh, 12 Jul 2012what a foolness nokia.as you are seeing that every company other than nokia are going further ... moreyour nonsense comments well not accepted here lol!!! 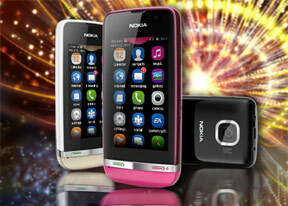 shubh, 18 Jul 2012is nokia asha 311 is a dual sim phone plz tell me?????? ?I don't think so. There is nothing on this specs sheet mentioning that it is a dual SIM. shubh, 18 Jul 2012is nokia asha 311 is a dual sim phone plz tell me?????? ?No it is not dual sim , but their is no advantage of dual sim because most phone have dual sim stand by rather than dual active. Once upon a time, I used to be a die hard fan of Nokia Mobiles and their services. I used to eagerly wait for new models that they would release or announce to release. I had sleepless nights waiting for new models from Nokia. But now, i dont know wat happend to Nokia developers/designers), they are releasing such an disgusting, stupid and a**hole products that im starting to hate Nokia and their mobiles, and im forced to like Samsung mobiles, even though i dont like'em much. Wat da F* happened to NOKIA??? is nokia asha 311 is a dual sim phone plz tell me??????? they made a mistake while programming the kernel part and realised it after gingerbread..
if they change the kernel they have to change the coding for all the the apps. Good feature phone by Nokia but overpriced.Samsung's galaxy pocket is available in the same price range with much more features and a better operating system. Nokia is d best mob phone comp all over d world.